Nasa has named the astronauts who will fly the first missions into space on commercially provided rockets and capsules, starting next year. The nine individuals will go up on systems developed by – and contracted from – the Boeing and SpaceX firms. Most have previous experience in orbit. Among them are the commander and pilot of the final shuttle mission in 2011. For the past seven years, Russian rockets have been the only way to get people into orbit. Nasa Administrator Jim Bridenstine introduced the astronauts during a ceremony at the Johnson Space Center in Houston, Texas. “For the first time since 2011, we are on the brink of launching American astronauts on American rockets from American soil,” he told the enthusiastic audience. The commander on the historic last shuttle mission, Chris Ferguson, is now a Boeing employee and has been heavily involved in developing the company’s CST-100 Starliner capsule. When this ship makes its maiden crewed flight in the middle of next year, launching atop an Atlas rocket from Cape Canaveral, Ferguson will be joined by Eric Boe and Nicole Aunapu Mann. Boe is a former shuttle pilot; Mann will be making her first trip into space. 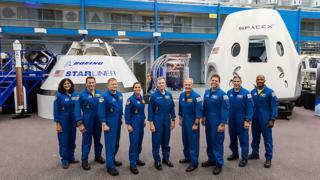 The SpaceX Dragon capsule, on current timelines, is set to make its maiden crewed flight in April. It will ride atop a Falcon-9 rocket from the Kennedy Space Center. It will actually use one of the old shuttle pads, although this has now been modified for the smaller Falcon. At the helm will be Doug Hurley and Bob Behnken. Hurley was the pilot on the last shuttle mission. Behnken has been in space on two previous occasions. The initial crewed flights by Boeing and SpaceX will spend a short period in orbit – measured perhaps in days or a few weeks, and attached to the International Space Station (ISS) – before coming back to Earth. It is on later missions that the crew capsules will go to the station and dock for more extended stays, and Nasa also named the astronauts for those first flights as well. For Boeing, this introductory long-duration mission includes Josh Cassada, who has never been in space before, and Suni Williams, who is one of the most experienced American astronauts in history, having spent a cumulative 321 days in orbit through her career. For SpaceX, such an ISS mission would involve Victor Glover, another newbie, and Mike Hopkins, who has already spent 166 days on the sky-high lab during two tours of duty. Nasa took the decision after the shuttle retired to turn transportation to low-Earth obit destinations into a service that it could buy. It has given seed money to SpaceX and Boeing to incentivise them, but the companies themselves have also had to invest their own money. Nasa’s motivation was to save money it could then spend on a rocket and capsule system to take humans back to the Moon and on to Mars. That system will likely fly some time early next decade.